Johnnie Walker is getting gussied up for the holidays with a rare luxury liquid and an artful decanter and box set to house it. The triple-matured John Walker Master's Edition was crafted from six rare whiskies, each aged for a minimum of fifty years and drawn from distilleries that existed during the lifetime of founder John Walker. Only one hundred of bottles of this exclusive expression exist. Speaking of bottles, this hand-selected spirit is presented in individually numbered double-cased black crystal decanters by Baccarat. Those artful creations are then packaged in cabinets made by N.E.J. Stevensen, Cabinet Makers by Appointment to Her Majesty The Queen. According to tbe brand (you didn't REALLY think we'd get to sample this one, did you? 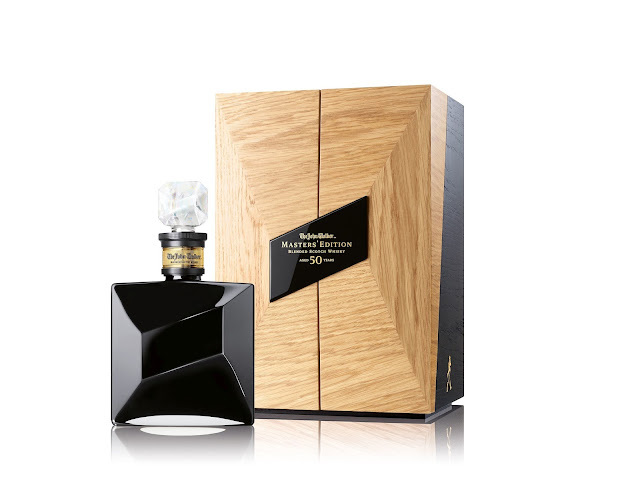 ), John Walker Master's Edition presents notes of black currant and citrus, which give way to rich dark chocolate and then finishes with cooling menthol and subtle smokiness. If you're looking to purchase this cask-strenght (86.6 proof) elixir, expect to spend at least $25,000.